To the extent that a crisis does exist at the border, as the president has suggested, it’s not one involving a surge in illegal crossings or terrorist threats. Local officials, nonprofits and activists have been increasingly raising the alarm that a humanitarian crisis, exacerbated by Trump administration policies surrounding asylum claims, is brewing. On Tuesday night, President Donald Trump will address the nation, laying out his case that a crisis exists at the U.S.-Mexico border and making a case for the necessity of a border wall. The federal government is currently shut down over a dispute over funding for the wall. The president has suggested he might declare a national emergency as a workaround to the impasse. To the extent that a crisis does exist at the border, it’s not one involving surges of illegal crossings or terrorists pouring into the country. But local officials, nonprofits and activists have been increasingly raising the alarm that a humanitarian crisis, exacerbated by Trump administration policies surrounding asylum claims, is indeed brewing at the border. Overall, border apprehensions – a proxy for illegal crossings – are very low. They aren’t as low as the first year of Trump’s presidency, but they’re still historically low when evaluated over time. At the same time, the profile of people coming to the U.S.-Mexico border is changing. More asylum-seeking families and children are coming to the border. Along the total southwestern border, Border Patrol apprehended 107,212 family units in fiscal year 2018, up from 75,622 in 2017. In fiscal year 2018, 53,901 families turned themselves in to a port of entry along the border, up from 29,375 last year. November saw the single highest number of families crossing ever recorded, more than 25,000. San Diego had the largest increase in families presenting themselves at ports of entry along the border. In fiscal year 2018, 15,772 presented themselves at a California port of entry, up 124 percent from last year. The local Border Patrol sector apprehended 4,408 families crossing illegally, a 50 percent increase from last year. Tuesday morning, the San Diego County Board of Supervisors talked for two hours over how to address the need for shelter for migrants coming into the country. In late October, immigration officials began dropping asylum-seeking families who’ve passed an initial screening interview onto San Diego’s streets, often with little or no resources. Due to a 1997 settlement, the government can legally only detain children who have traveled with their parents for 20 days. Until October, the Department of Homeland Security reviewed migrant families’ post-release plans, ensuring they had travel arrangements to connect with a sponsor elsewhere in the United States – typically a relative or friend willing to receive them, and making sure they go to their immigration hearings. But it stopped doing so amid the uptick in families requesting asylum along the U.S.-Mexico border. The agency says it no longer has the capacity to conduct those reviews. These families have all gone through the first step in seeking asylum. They’ve been interviewed by an asylum officer and found to have a credible fear of returning to their country. They’re fitted with ankle monitors and given court dates to continue with their asylum proceedings. Most asylum-seeking families just need to find their way to their sponsor elsewhere in the country. But on the streets of a city and country they don’t know, unable to speak English, and often exhausted and sick from traveling thousands of miles and spending time in detention, they’re lost upon arrival without support and guidance. As city and county leaders struggle to find solutions, local nonprofits and activists have filled the vacuum by launching their own shelter. They often scramble each night to ensure there are enough beds for arriving families, arrange their transportation and medically screen them for communicable diseases. “These individuals are not without shelter, they’re without shelter here,” County Supervisor Nathan Fletcher said Tuesday. Fletcher and Supervisor Greg Cox brought forward a resolution Tuesday to engage further with the state and federal governments on the shelter issue, form a working group and look at its own capacity to shelter some of the asylum-seekers. Roughly 4,500 people have been released into San Diego since the change in practice, and leaving the families on the streets to fend for themselves has become a non-partisan issue. San Diego already has a homeless population of more than 8,500, the fourth largest in the country. San Diego is also one of the largest hubs of human trafficking in the country, an industry researchers have guessed is worth $810 million annually. San Diego was also home to one of the nation’s most deadly hepatitis A outbreaks in modern history in 2017 – a crisis fueled largely by unsanitary conditions among those forced to live on the streets. Pretty much everyone acknowledges that simply leaving these families to fend for themselves will make them vulnerable to human trafficking, increase our homeless population and could fuel another public health crisis. After weeks of scrambling and finger-pointing, concrete proposals are beginning to emerge. The city of San Diego has offered up a shuttered juvenile detention facility as a potential temporary shelter space. The county approved Cox and Fletcher’s resolution Tuesday with some minor changes. There’s still disagreement over how much local resources should be spent to help migrants, when San Diego has its own homeless population to address. Fletcher argued the county needs to “stop the bleeding,” meaning it needs to ensure the migrants don’t become homeless in San Diego, worsening the city’s existing problem. Even homeless advocates, like Michael McConnell, came before the county to plead for action. The county has recently started providing nurses to conduct medical screenings to ward off public health issues. The county has been on the receiving end of scathing reports for its lack of urgency during the hepatitis A crisis, and it wants to avoid making similar mistakes. One thing of particular concern is varicella, the virus that causes chicken pox, said Nick Macchione, the county director of Health and Human Services. On average, he said, the county has seen two cases per year. Since October, when the government began dropping migrant families on San Diego’s doorstep, the county had seen nine cases. Board of Supervisors Chairwoman Dianne Jacob said she was inclined to continue prioritizing our own vulnerable populations first, while ensuring the county addresses, in particular, any looming public health issues. Jacob and Gaspar voted against the county recommendation Tuesday to identify properties for a temporary migrant shelter, but voted in support of the other three recommendations to address the matter, including continuing to lobby the state for assistance and forming a working group on the issue. Even Jacob expressed frustration with the federal government. Just last year, Gaspar, with the strong support of Jacob, led the county to join in the Trump administration’s lawsuit against California’s so-called “sanctuary laws.” Gaspar even went to Washington, D.C. for a roundtable with the president criticizing the California laws discourage local law enforcement from participating in immigration enforcement. Tijuana, too, is facing a migrant shelter crisis. All its existing shelters were nearly at capacity when the roughly 6,000-person caravan arrived in November. Thousands of Central Americans waiting to request asylum in the United States remain in substandard living conditions in a theater-turned-shelter. They were moved there after another makeshift shelter, a sports-complex-turned shelter, was flooded. Tijuana, which is already dealing with record levels of violence (the city had more than 2,500 homicides in 2018), now must address how to accommodate arriving Central Americans fleeing their home countries. The migrants face weeks- or months-long waits to be able to request asylum because U.S. Customs and Border Protection only processes a limited number of people every day, which have ranged anywhere from 20 to 100 daily over the past year. Right now, their basic needs – how they’ll eat, where they’ll sleep, how they’ll receive medical care – are all dependent on some city and state workers from Tijuana and Baja California and many good Samaritans, activists and service providers. The county of San Diego has even sent hundreds of hepatitis A vaccines to public health officials in the city. The tension in Tijuana has reached a boiling point several times already. 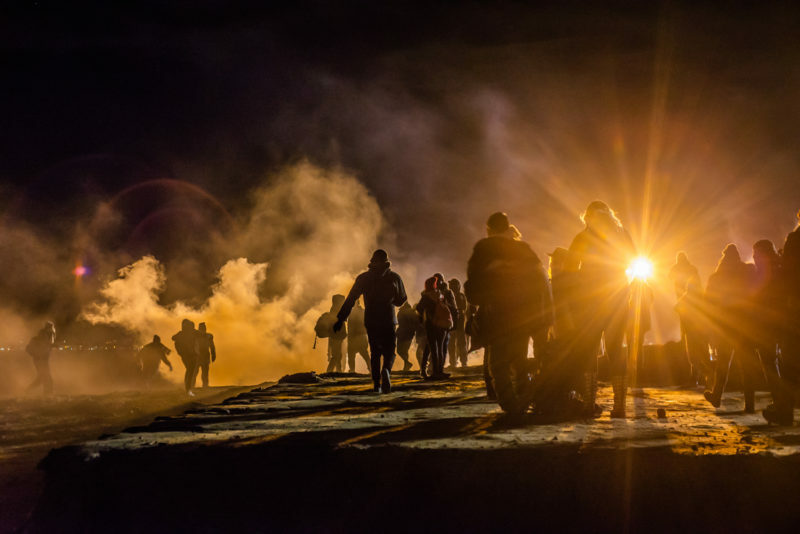 One was the Sunday after Thanksgiving, when hundreds of migrants ran toward the border during a protest and U.S. border agents fired tear gas their way. The San Ysidro Port of Entry completely shut down for five hours following the incident – an unprecedented move that has major economic consequences. Two Honduran teens who had made the journey with the caravan of Central Americans were tortured and murdered in December. A third, who was with them but managed to escape, is now in protective custody. On the night of New Year’s Eve, roughly 150 migrants, frustrated at the wait to request asylum, once again tried to approach the border to cross illegally into the United States illegally. They too were met with tear gas.